Google will be shutting down their Inbox App soon, but the company will be using this platform to research and develop new features for the Gmail App. 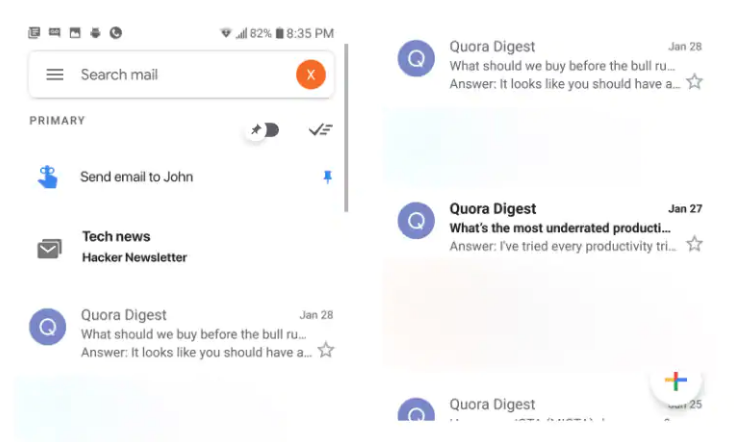 We could also see more of the Inbox features getting transferred to Gmail in the coming months, which will be useful for the users who earlier used the Inbox App. The company had earlier informed the Inbox users to switch to Gmail for the time being because of the shutdown. There’s still plenty of work to be done before all of Inbox’s features get transferred over to Gmail. Got this leaked photo from a friend. I’m guessing Google is going to showcase the new Gmail with new features such as reminders, pins, and bundles at I/O 2019. P.S – Had to blur out sensitive info. Meanwhile, if this screenshot is reliable, Google is also working on reminders that users are able to quickly create and schedule. It’s not clear if these reminders originate from Google Tasks or are powered by the Assistant/Google app backend. The former would make sense in light of Tasks integration on the web, but the latter is more widely used.